Mathesiusite: Mineral information, data and localities. 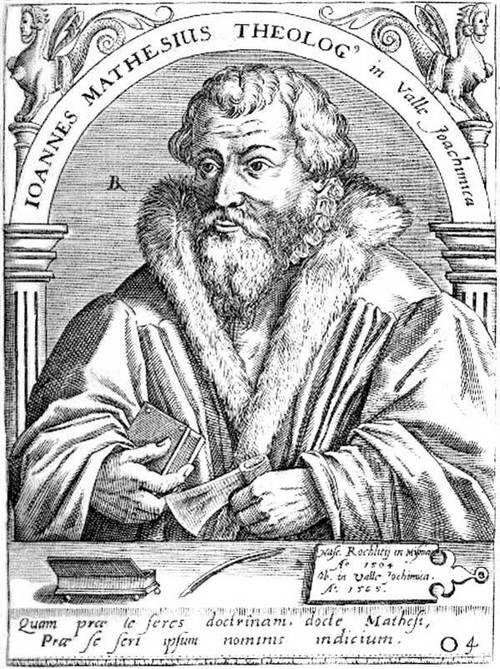 Named in honor of Johannes Mathesius (24 June 1504, Rochlitz, Saxony – 7 October 1565, St. Joachimsthal, Bohemia), a Lutheran parson and humanist. He was also an "amateur mineralogist" and a friend of Georg Agricola, "the father of mineralogy". They both lived in St. Joachimsthal (now Jáchymov). This page provides mineralogical data about Mathesiusite. Acicular aggregates of prismatic crystals up to ~200 μm long and several micrometers thick. 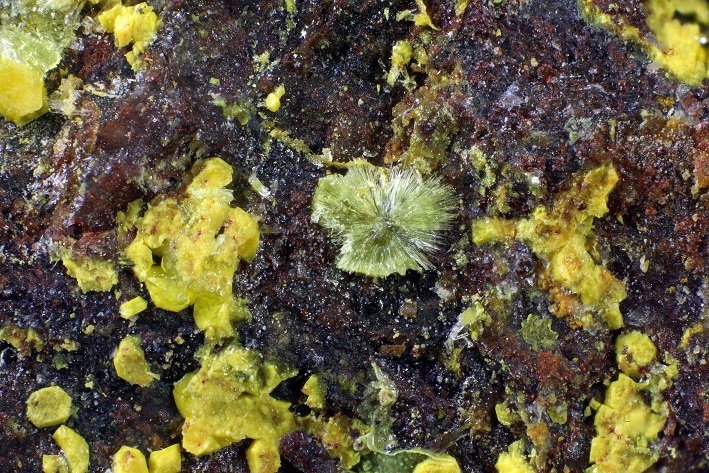 A secondary mineral formed during post-mining processes, found on fractures of gangue. Adolfpateraite 1 photo of Mathesiusite associated with Adolfpateraite on mindat.org. 7.DG.15 Carraraite Ca3(SO4)[Ge(OH)6](CO3) · 12H2O Hex. 7.DG.20 Rapidcreekite Ca2(SO4)(CO3) · 4H2O Orth. 7.DG.25 Tatarskite Ca6Mg2(SO4)2(CO3)2(OH)4Cl4 · 7H2O Orth. 7.DG.30 Nakauriite Cu8(SO4)4(CO3)(OH)6 · 48H2O Orth. 7.DG.35 Chessexite (Na,K)4Ca2(Mg,Zn)3Al8(SO4)10(SiO4)2 · 40H2O Orth. 7.DG.45 Chelyabinskite (Ca,Mg)3(SO4,CO3)2[Si(OH)6] · 9H2O (?) Orth. Plášil, J., Veselovský , F., Hloušek, J., Škoda, R., Novák, M., Sejkora, J., Čejka, J., Škácha, P. and Kasatkin, A.V. (2013) Mathesiusite, IMA 2013-046. CNMNC Newsletter No. 17, October 2013, page 3001; Mineralogical Magazine, 77, 2997-3005. Plášil, J., Veselovský, F., Hloušek, J., Škoda, R., Novák, M., Sejkora, J., Čejka, J., Škácha, P., Kasatkin, A.V. (2014): Mathesiusite, K5(UO2)4(SO4)4(VO5)(H2O)4, a new uranyl vanadate-sulfate from Jáchymov, Czech Republic. American Mineralogist, 99, 625-632. Plášil, J., Veselovský , F., Hloušek, J., Škoda, R., Novák, M., Sejkora, J., Čejka, J., Škácha, P. and Kasatkin, A.V. (2013) Mathesiusite, IMA 2013-046. CNMNC Newsletter No. 17, October 2013, page 3001; Mineralogical Magazine, 77, 2997-3005.;Plášil, J., Veselovský, F., Hloušek, J., Škoda, R., Novák, M., Sejkora, J., Čejka, J., Škácha, P., Kasatkin, A.V. (2014): Mathesiusite, K5(UO2)4(SO4)4(VO5)(H2O)4, a new uranyl vanadate-sulfate from Jáchymov, Czech Republic. American Mineralogist, 99, 625-632.